We frequently use words like privilege and honor to describe the clients we serve. And they ring true (well, most of the time). Sure, some initiatives carry a bit more gravity than others. But in the end, we deeply appreciate being trusted with our clients’ growth and the opportunity they give us to create a lasting impact. But those words don’t do justice to how grateful we were to help bring Yoko Ono’s SKYLANDING to life. For 3 years, we’ve been a part of the effort to shine a light on the historical and cultural significance of Chicago’s South Parks, and the critical importance for our city’s reinvestment there. Along with our client, Project 120, we partnered with the City of Chicago, the Chicago Park District, and a litany of community and corporate stakeholders to build support for the rich tapestry of stories at the heart of these parks. It was this storytelling that attracted Yoko Ono to Chicago’s Jackson Park. On her visit to the park in the spring of 2014, Yoko was immediately struck by the parallels between her life and the overarching Japanese-American narrative that blossomed from this site during the Columbian Exposition of 1893. The story behind the Garden of the Phoenix and the pavilion that stood on its grounds before it was lost to arson reflected critical aspects of her own identity. As America and Japan swung between conflict and peace, so too did her own life. Feeling the tension this land held, Yoko saw an opportunity for a panacea that brings together nations, communities and global citizens all in the name of peace. Along with this deeply personal connection to the park’s history, Yoko has always had a special place in her heart for Chicago. Reminiscing over her and John’s first visit to the city, Yoko envisioned a symbol of lasting peace as she watched the sky reflect in the waters of Lake Michigan. Last year, Yoko Ono returned to the Garden of the Phoenix to perform a ground healing ceremony and prepare the park for her first and only permanent public artwork in the United States. On October 17th, 2016, SKYLANDING was unveiled to the world. 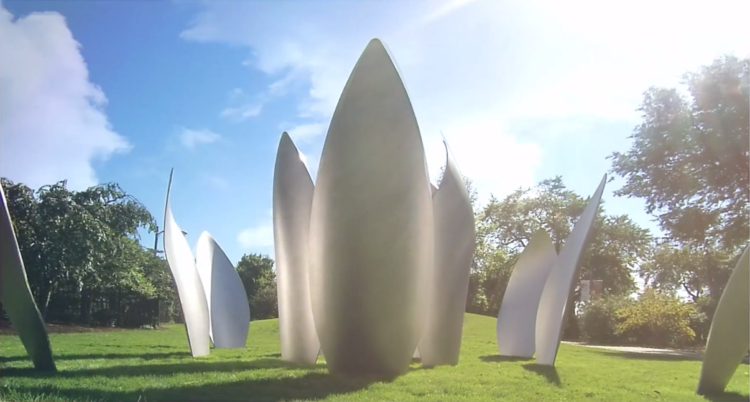 A stunning lotus of eight 12-foot tall stainless steel petals arising from the ashes of the Phoenix Pavilion now resides in Jackson Park. Our city could not be more thrilled with this gift. SKYLANDING isn’t just a work of public art, it’s a call to action for peace brought to a world in desperate need of it. In order to extend this call to action beyond the park, SKYLANDING needed to be more than a sculpture. Yoko’s work often requires its viewers to participate, so SKYLANDING needed to be a multimedia experience to truly communicate with the world. Enter envisionit. On the same day the sculpture was unveiled, our agency launched SKYLANDING.com. The site wasn’t just meant to be an informational home, but an interactive extension of Yoko’s work. Talk about an exciting challenge. Working closely with Robert Karr, the founder of Project120, and Yoko herself, we set out to capture the spirit of her work in an entirely different medium. As we dug deep into the work of Yoko Ono and her intentions for the project, we began to grasp themes and opportunities to connect visitors to her message. At the core of Yoko’s call to action and a significant touchstone of Japanese culture is the act of wishing. Yoko has embraced the wishing tree as a central element of her work, and we saw in it an opportunity to invite global participation. Instead of leaving wishes at a tree, what if people could leave wishes on the site? 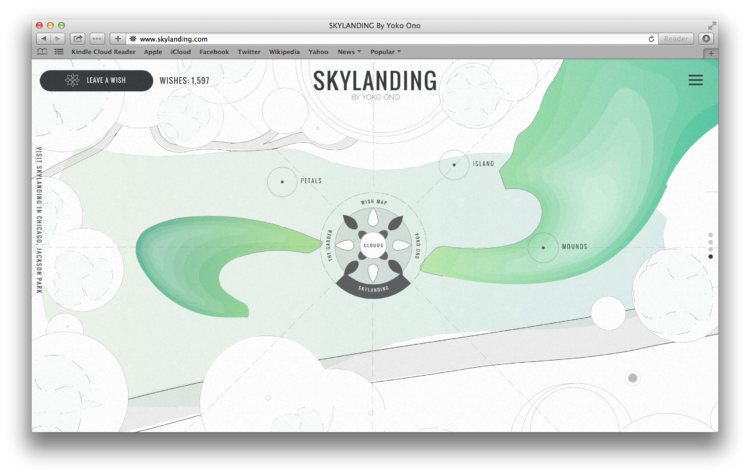 SKYLANDING.com was developed to introduce visitors to the project and its connection with the park and city. But we’ve also created a vehicle to connect people all over the world with Yoko’s call to action. Upon entering the website, visitors are encouraged to share their wishes and read the wishes of others from around the world. The user can view geo-positioned locations marked on a global map to see (literally) where people are coming from. In order to extend reach, we included a functionality to aggregate wishes posted to Twitter with the hashtag #skylandingwish. The result is a striking experience that illustrates the global appeal of Yoko’s message. We were also fortunate to capture one of the few interviews with Yoko over the last decade. The sentiments she expresses in the SKYLANDING video inspire all of us to reflect on how we can help contribute to peace in this world. Everyday, from the streets of Chicago to all corners of the world, we’re confronted with negativity as we struggle to overcome our differences. The wishes collected on the SKYLANDING site are a refreshing reminder of what unites us. Our agency is truly grateful to be able to connect the world with Yoko Ono’s vision for peace, and we invite all to visit both Jackson Park and SKYLANDING.com to take up the call. 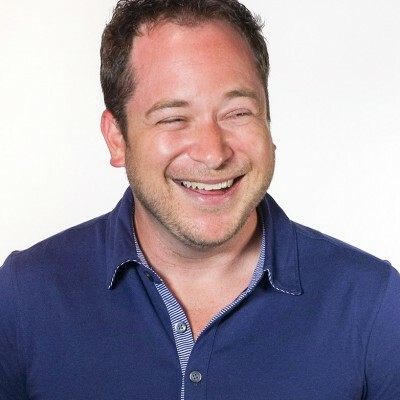 Introducing Joe Mathieu, Media Director!